When I got back from the US a few days back, I had intended not to travel for at least two weeks to get enough time to recoup from the trip. Recoup, did I say? It was mostly fun, wasn't it? Yes, of course! But don't be so harsh on me. What I meant is to recoup in terms of the dialysis; to settle in to to my nocturnal routine so well that I no longer felt drained after my dialysis. Despite that, in less than a week of my returning, I found myself on a cab in the early hours of the morning on the way to the airport enroute to New Delhi on work! As we stopped at a signal, the cabbie did something with his finger that made me make a mental note of not handing him my credit card at the end of the trip. I instantly remembered an incident at Heathrow on my recently-concluded trip. The terminal generally has a sprinkling of Indians. You walk past the odd Sardarji or two once in a way. When your flight is announced and you go to the gate of departure, you hear ONLY Telugu! You look around you and see so many familiar faces. You immediately get the feeling that you've already landed at Hyderabad. People who haven't even met each other are conversing animatedly in Telugu discussing Telangana like they never might have before (the decision was announced just a couple of days back). To be among your own can be a welcome relief, I guess! The guy in front of me had his hands full. He had the boarding pass in his hand and was asked for the passport by the white lady behind the counter. He thrust his boarding pass between his lips and reached out for his passport. The lady was aghast. After checking the passport, she wouldn't dare touch the boarding pass. She requested the guy the place it below the scanning device. The guy sheepishly complied! When I got into the cab at Delhi, I told him where to go. He did not seem to know. Seeing my iPhone, he asked "Usme kyun nahi set karte? ", referring to my Google Maps app. I smiled in response, did that and he happily followed the directions that the lady inside the phone sweetly offered at every turn. I especially loved the way she pronounced "Shantipath"! I was amazed at our reliance on Google Maps these days and wondered how we ever managed to find any place all those years before Google Maps?! As we left the airport, we soon entered what is called Lutyen's Delhi. We passed by all the embassies and then the houses of all the ministers. We also passed by the Congress Headquarters on Akbar Road. All these houses were huge, had extremely well-manicured lawns, very well laid out roads in front of them and a beautiful feel to them. 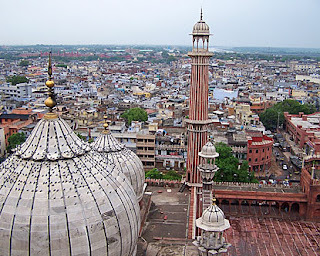 Once you cross over to the rest of Delhi, you have a very crowded, dirty and filthy city. It is no wonder that politicians hanker after power so much! Life can be good in the better part of Delhi! The traffic in Delhi, like many other metros in India today can get nauseating at times. The traffic is not even disciplined like in Mumbai but is a tad worse than even Hyderabad. People don't follow the lane system, cut across all the time and do not hesitate before driving on the wrong side. I saw a line of cars get on the footpath at a particularly busy intersection. I was staring with amazement when a speeding motorcycle got onto the same footpath and jumped off the other side - the motorcycle and the rider were airborne for a good few seconds! We went to the famous Bengali Market for lunch to sample the Chole Kulche I had heard so much about. We went to a place called Nathu's. 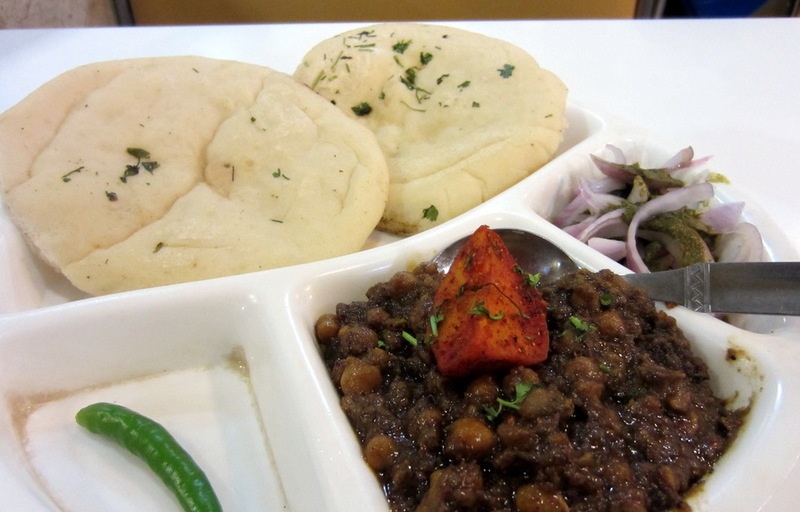 The Chole Kulche was good. I wouldn't say it was extraordinary. The hype probably killed it! The Chole were good. The Kulche were passable. I did not understand the big deal about it! For dessert, we ordered Jalebis. What came was disaster! Jalebis have to be crisp and piping hot. We guessed that these were probably an older lot which they simply put back in hot sugar syrup! Not for nothing is the "Dilli ka thug" famous! The next day, we decided to go to Haldiram's at Cross River Mall close to Vivek Vihar. The Chole Bhature was good, better that the Nathu's version. We also did Chawal with Dal Makhani and Sweet Lassi. All these were good. However, to be honest I was disappointed with the food in Delhi. I found my answer when I was talking to a local. When I told him about where I ate, he almost berated me. He said, in Delhi, you get the best food on the streets! "Well", I promised him, "next time I know who to ask for advice!"